Home Movies Box-office Direk Chito S. Roño and Best Supporting actor Christian Bables collaborate for the first time in "Signal Rock"
Box-office Direk Chito S. Roño and Best Supporting actor Christian Bables collaborate for the first time in "Signal Rock"
A well-respected and a box-office hit director, a budding actor with a bright future in the industry, and a highly relatable story all brought together in “Signal Rock,” the highly-anticipated film offering by CSR Film PH Production. Directed under the helm of versatile film director Chito S. Roño, and starring the award-winning actor Christian Bables, “Signal Rock” is such a tale that hits close to home. It tells the story of a typical Filipino family aspiring for a better life. It’s about a family, albeit poor, lives in the beautiful island of Biri in Samar. Just like many Filipinos, one member of the family made the ultimate sacrifice of leaving her loved ones behind to work in a foreign land, in the hope to earn money and send it back home. “Signal Rock” revolves around Intoy (Christian Bables), who lives in an impoverished fishing island, taking care of his parents, while waiting for his sister Vicky, an overseas Filipino worker, send them money. Just like many women in the island, Vicky has flown to a foreign land, and married a foreigner, as a practical way to help their families back in the Philippines. Since Intoy lives in a remote area, getting in touch with Vicky through a mobile phone is a constant struggle. The only way to get through a call to Vicky is to get a good signal by scrambling on the strange rock formations on the island. But the better life they hope for goes down the drain when Vicky, together with her daughter, flees her husband, who turns out to be abusive. This leaves Intoy, poor but with a gift of gab, to be resourceful and come up with a master plan to help his sister and his niece from their adversity. Intoy steps up to become the hope of the family to protect its members get them safely. Intoy and the rest of the characters are all based on real people and the story is inspired by true events that took place in the 90s. This is the second time that Direk Chito shot a film in Biri, Samar. Known to be a maverick filmmaker, Direk Chito is tasked to breathe life to this story with his signature brand of directing. For him, Signal Rock is a simple yet realistic drama. The film is also produced by his production with his Director of Photography Neil Daza and written by the award-winning Rody Vera. More than three decades in the industry, the candid director has produced some of the notable movies that stood out in different film genres: Bata, bata... Paano ka Ginawa? (1998), Feng Shui (2004 and 2014), Sukob (2006), Caregiver (2008), The Healing (2012), Etiquette for Mistresses (2015), and The Ghost Bride (2017), to name a few. This year, he offers his passion project film to the moviegoers. "Ang totoong kwento ng Signal Rock ay tungkol sa mga ordinaryong tao sa probinsya na remote, mga taong lahat ng mga kasama nila nagsipag-abroad, ito ang place na iniiwan para makapagbigay ng suporta sa pamilya. Marami na tayong kwento tungkol sa mga OFW, pero ito ang kwento ng mga taong napagiwanan sa probinsya, na kung tawagin ay Bagtik." explains Roño. Christian has been acting and given bit roles since 2011, but was given his biggest break in the sleeper hit Die Beautiful, an entry to the Metro Manila Film Festival entry. In the movie, Christian gave justice to Barbs Cordero, the best friend to Paolo Ballesteros’s Trisha Echevarria. Christian was so convincing as a cross-dresser in the movie, that different Best Supporting Actor trophies were awarded to him by a number of awards-giving bodies: Film Academy of the Philippines, Metro Manila Film Festival, and Gawad Urian. 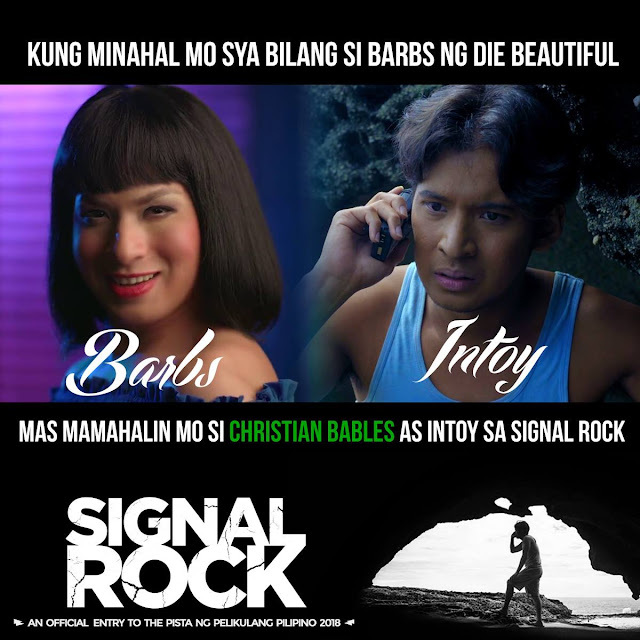 For Signal Rock, Bables manages to be hand-picked personally by the master director Chito S. Roño. "Hindi ko binigay sa kanila ang script ng pelikula, pinapabasa ko lang ang mga linya nila kapag malapit na kaming mag-take ng eksena." says Direk Chito. Bables shared that he did his best for this film since his dream is to work with the veteran director. "Gusto ko ibigay lahat para sa passion project ni Direk Chito. May mga ginawa ako dito na first time ko, na proud ako dito ko ibinigay. Sana abangan po ninyo. Ang ganda ng location namin at talagang ma-aappreciate ninyo ang Pilipinas." Select screeners of the film also shared that the movie is tear-jerking, creating awareness of small town stories. The cast and crew stayed in Samar for 15 days, "To be more realistic, tumira talaga kami sa Samar. Hanggang ngayon remote pa talaga ito. Nakikitira kami sa mga tao roon, walang special treatment. Nasanay na sila na naglalakad papunta sa shooting location. Nakikihalubilo sa mga tao doon, naging familiar na kami doon. Dito namin lalong nakilala ang mga totoong tao, totoong buhay, parang naging bahay na namin doon at wala talagang signal!" shared Roño. Signal Rock is also an entry to the upcoming Pista ng Pelikulang Pilipino Film Festival 2018. The film also stars, Elora Españo, Mara Lopez, Francis Magundayao, and the veterans actors Daria Ramirez, Arnold Reyes, Nandiing Josef, Archie Adamos, Sue Prado, JayR Versales, Keana Reeves, Julia Chua, Kokoy De Santos, Jomari Angeles, Rubu Ruiz, Mon Confiado, Ces Quesada, Lee O'Brian, Dido Dela Paz and many more. Signal Rock is brought to us by CSR Production and distributed by Regal Entertainment, Inc.